When you flip a light switch in your home, the lights come on. That’s how things work. We pretty much take it for granted. We rarely question how it really works behind the scenes. It’s very cool that it does, but there is an enormous amount of machinery and manpower that is required to make it happen. The fact is that power generation takes about $378 billion, or roughly 1.4% of the total economy to keep power flowing to approximately 319 million US citizens and all of US industry. 1.4% is a very small number and says that the utility industry is incredibly efficient at generating and delivering power. Generating electricity boils down to turning a generator and sending power down a pair of wires. This, by the way, is where Edison had it wrong. DC power is very inefficient over long distances. Tesla has this part right, because as we have found, AC power does much better, but involves some complexity. At the end of the day, electricity has proven to be, by far, the most efficient energy source for doing work. We see the result of the various types of work from making cars to keeping a refrigerator cold, operating semiconductor fabs to make all our cool electronic toys, you name it. In recent years there has been widespread debate about how we make electricity, what fuels will we use to turn the turbine. Will it be coal and natural gas combustion to heat water and make steam? Anything that burns fuel causes unwanted byproducts, pollution of some type, although the industry has done a great deal to minimize these effects. Nuclear power uses the heat from radioactive elements to make steam and turn the generator. While nuclear power plants in the past have had some terrible failures, Chernobyl and Fukusima, newer reactor designs have been developed that are completely safe and we need to consider them as part of our overall portfolio. Alternative energy, solar power and wind power, have grown in the last few years as an option, but these sources are intermittent and storage technology has not kept pace. 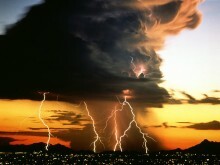 So there is a problem, because if there is too much intermittent energy on the network, it introduces unpredictability. Maybe your lights will still turn on, but large users like semiconductor fabs may be forced to reduce their operations due to shortage. So the question is; who decides how we manage and implement resources to keep everything running? The short answer is the utility companies, but in many service areas, the utility companies are under the authority of the State government where they operate. State legislators are often not technically versed in the issues and make regulations that are somewhat ?wishful thinkingi?? instead of letting the experts do their jobs. To make matters worse, the Department of Energy has created Renewable Portfolio Standards (RPS) and offered the States inducements (federal funding) to conform to these guidelines. Which is why we are seeing so much wind and solar coming into the market. There is no national discourse on the subject. Voters aren’t part of the equation. So who gets to decide where electricity comes from? Definitely NOT you or me. Comments Off on Where does electricity come from? Electric car sales in the US are up approximately 50%. Some forecasters are expecting similar growth in 2014. This should be great news to everyone who makes electric cars and anyone interested in purchasing an electric car. That news should be tempered with the fact that change in the automotive industry comes slowly. Electric cars are coming, for sure, but its going to take quite a long time before we see the much vaunted 1,000,000 electric cars on the road. The reasons for this are not obvious, and somewhat complex. The electric vehicle market is still very confusing. The product choices are very complex, a function of the technology. There are dual drivetrain hybrids in which both a gasoline engine and an electric motor can turn the rear wheels. The most notable, the Toyota Prius, was one of the early vehicles for sale in what was a completely unexpected development. The dual drive train hybrid is the most complicated vehicle because a computer must manage both drive trains and optimized for efficiency based on driving conditions and the drivers demands. In the original SAE vehicle specification, 4 Power PC processors were required to accomplish this engineering marvel. A Plug In electric, or pure electric vehicle is one that operates from a battery. Its just a giant radio control car, without the radio control. The ultimate in simplicity, there is only one moving part, the motor turns the wheels through a single speed gear reducer. There is practically nothing to maintain but the battery. This makes the battery technology crucial. Drive range, life expectancy, vehicle weight and cost are all significantly impacted by the battery. Until the advent of lithium battery technology, a serious pure EV was not worth talking about since the dismal performance of the General Motors EV-1 almost 20 years ago. Tesla is the most recognized pure EV on the market. The middle ground is the true hybrid. In a true hybrid, only the electric motor can turn the rear wheels. When the batteries start to get low, an on board engine-generator kicks in to charge the batteries and run the vehicle. The efficiency of drive by wire, turning the wheels with electric motors, is so much more efficient than doing it from a combustion engine, that the generator can be 50 horsepower, run at constant speed for ultra-low emissions, and carry only a few gallons of gas. The Chevy Volt is the leading example in this category. Electric cars are coming, just slower than expected. With all the emphasis on how important wind power is to the future of energy supply, it is surprising to me that we haven’t seen a variety of dedicated generator designs. There are a few, but only a few. Maybe this is because the magnetics of generator design are not a popular topic in engineering schools. It is difficult to find a physics professor who is knowledgeable on this subject. Consider the basic operating requirements. Horizontal wind rotors turn at low speed, typically between 7 and 23 RPM. Very low speed for an electric motor or generator when the industry norm is 1200 to 1800 rpm. Basically the wind industry has attempted to take existing motor designs at 500kW and above and make them work, even though wind power is not what those machines were designed to do. Using an “off the shelf” generator would make sense during early prototyping to avoid the expense of producing a new generator design. But where there is ongoing manufacturing, GE claims to have 16,500 turbines installed, the investment would be justified. The power electronics guys are having to deal with the exact same problem when it comes to making inverters for the wind industry. Turning dc power into 60 cycle ac power is not news, but having wildly varying input power changes the solution dramatically. There are dozens of suppliers in the solar market with inverters 500kW and up to 2MW who have successful solved this problem for their markets. To come up with a unique wind generator requires a clean sheet of paper. Just as Tesla insisted on it’s own custom motor with copper bars to increase driving range, the solution to a generator for the wind industry is starting from scratch and focusing on the needs of the application. Boulder Wind has a large diameter circumferential generator so it can be directly driven by the propeller blades of a standard horizontal wind turbine. The design is high pole count so that it runs efficiently at low speed. 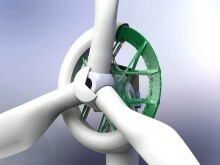 The new unit is already showing increased efficiency in early testing and should be deployed in wind turbines by 2017. General Electric has been demonstrating a 4MW PM direct drive wind turbine and planning a 10MW superconducting generator for the wind industry. Among the earliest and most innovative designs for onshore and offshore application, these systems eliminate the gearbox cost, weight and inertia making direct drive a significant improvement in wind power. These improvements are all the result of the same thing; Motor Centric Design, examining the application of a motor or generator and looking for optimized solutions. Without this kind of starting point it is hard to image that wind power will ever become profitable.